Looking for a CB radio with the assurance of the Motorola quality seal? .... then look no further, the Motorola CB PRO™ is the answer! 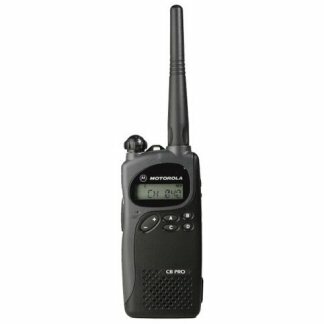 The Motorola CB PRO is an easy-to-use radio which operates on the Citizen Band and is ideal for any small operation wanting a simple, affordable CB radio built to the commercial quality that you have come to expect from Motorola. With 40 channels the CB PRO allows users to communicate instantly to one-to-one or one-to-many with just a push of a button improving operational efficiency. And the adjustable squelch level setting enables clear audio quality that is ideal for single site operations from hospitality and security to the rugged industrial environments of construction and mining.